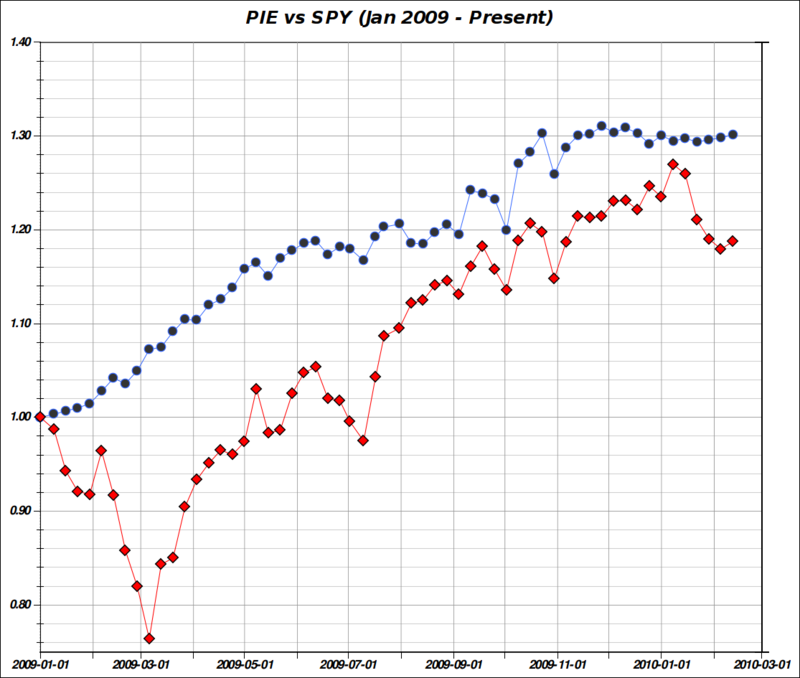 Below is the updated chart of PIE vs SPY since Jan 2009. The chart shows the actual performance of PIE, real trading account in in blue, vs SPY (The SPDR S&P 500 ETF) in red. Samples are weekly samples. It sure felt frustrating to sit in "the bunker" as I've been doing since the mid November 2009 peak as the market kept making new highs in December 2009 and January 2010. Now after the recent correction, I feel somewhat vindicated even though my timing in calling the top, has been far from perfect. I believe the mid January 2010 marked a long-term peak for the US market. It is notable that China and many other risk trade ETFs are in a clear downward trend now after peaking a few months earlier than US markets. My outlook now is very short term bullish to neutral (for early next week), after president's day, but longer term bearish. PIE is a bit over 11% above SPY while having much lower volatility. The markets keep being dominated by automated trading, with less and less participation from retail investors. The movements have little if anything to do with fundamentals. Navigating these markets is far from trivial so I'm keeping low exposure and using hedges. With sovereign defaults in everyone's mind, total break-down of trust in the financial system. Government reports that are hard to trust, and continuing defaults and deleveraging, the name of the game for me now is caution and preservation of capital. Sharpe ratio of PIE, since inception is 3.15 times better than SPY. The recent correction which PIE has sidestepped completely has been a major factor in this out-performance. One obligatory comment I feel I need to make here is that I'm not proud at all of having to play this financial game. I simply have no choice. The simple and plain truth, is that engaging in financial speculation is not creating any real value. I'd rather be a great musician, or inventor, or academic figure. Personally, I don't have a bank account with any of the "too big to fail" institutions, I use a credit union instead. I'd suggest everyone move their money to non-profit community banks. If government (regardless of what party is in power) cannot bring us the necessary change, this is the little we could do to make it happen. The following is the simple truth. You can't argue with the truth. On Sunday, September 21, 2008, Goldman Sachs was saved from collapse by the announcement that the Federal Reserve would allow it to become a bank holding company, implying unfettered access to (cheap) borrowing from the Fed and other forms of implicit government support. Less than a week before that event, one of Goldman's strongest competitors, Lehman Brothers was allowed to fail - it didn't get the same help that Goldman did. There's little doubt in my mind that without the lifeline thrown to Goldman it would have failed too, just like Lehman Brothers, Bear Stearns, and other Wall street firms who were in deep doo-doo for their highly leveraged bets. Goldman Sachs has returned the TARP money, but it has never repaid the US tax-payer for all the other favors it got, which kept it alive, including the billions of cheap dollars from the fed, being able to change accounting rules (no more mark to market etc. ), and getting 100 cents on the dollar for its own bad bets on CDO's via the (tax-payer) bail-out of AIG. All in all Goldman Sachs got about 70 billion dollars of tax-payer money at the perfect time when assets worldwide were close to multi-year lows. This is not even getting into the highly questionable, and possibly criminal, practices like loading up on credit default swaps of its own counter-parties and benefiting enormously from the collapse of AIG and others which it shorted in its own accounts. Nero fiddling while Rome is burning comes to mind. Goldman Sachs, the great American bubble machine is now in the cross-hairs of a growing number of powerful entities, including the EU over its dealing with Greece. Anyone remembers the break up of AT&T? or the antitrust campaign against IBM. The backlash against Goldman Sachs is growing by the day. I have a strong hunch that this will end up very bad for them. The amazing thing is that they seem to be in total denial (while showing unbelievable arrogance in their statements and compensation) and are totally unable to change their ways. Similarly, companies like JP Morgan, have benefited enormously from fed and government policies. JP Morgan has been given competitors like Washington Mutual and Bear Stearns, for pennies on the dollar, while the shareholders and credit holders of those companies were totally wiped-out. I think it is safe to paraphrase Churchill at this point: There have never been such a sweeping transfer of wealth from so many to so few, in such a short time, in the history of the world. Don't make a mistake about it. This is a war waged by wall street, with Goldman Sachs as the prime (though not only) example, against everyone else. What we have seen in the past 10 years or so, are not capitalism or free-markets by any means. Instead, we have a cruel capitalism for the poor and middle-class, and warm and fuzzy socialism, aka tax-payer bailouts, for Wall Street, its cronies, and corporate America high officers and special interest groups. Capitalism has been subverted. The playing field is now totally tilted, and the markets game is so rigged that the small guy has no way of winning. Even the data we're getting from the government (such as the recent 9.7% unemployment rate) can no longer be trusted. The same entities who have ruined the economy with their greed and reckless leveraged bets, have been bailed-out by us without us having a say. The too big to fail institutions have been made even more powerful and dangerous by the government playing favorites and giving the "survivors" free money to keep leveraging at the expense of main-street. The numbers speak for themselves: zero-interest rate policies for the banks with the steepest yield curve in years, with main-street sitting on the steep end. Record net job losses in the past 10 years, and real wages dropping for main-street, while bonuses paid by the bailed-out wall-street firms reaching an estimated 150 billions this year alone. People like me, who have been living well within their means, being very conservative with their finances, and maintaining a large cushion of safety, have no choice but to fight back by becoming nimble speculators. It is a shame, but what's our alternative? With the S&P 500 losing close to 50% of its value in the past 10 years (and much more than that in real terms) being buy-only, and long-term "investors" is simply not an option. The alternative of being nimble speculators, is to be eaten alive by the same voracious bankers who have already eaten our economy and mortgaged our and our children's future.